This 100% acrylic six panel officially licensed Made In The USA! 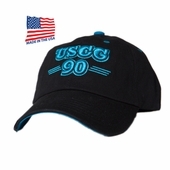 US Coast Guard cap features an embroidered Coast Guard Text with the establish date of the US Coast Guard. The adjustable slide-buckle closure allows this cap to be one size fits most.